WIth spring back the Tuis are back! this year they are rampant again and the blessing of our most vibrant, engaging and excitable bird makes my heart sing. Dogfighting and hooning from flower to tree and back, exalting in the verdant Northland spring. I have a favourite tumult of buds outside my dining room and they have been performing their circus acts there for my pleasure. They are my favorite intersection with the natural environment of rural/urban landscape by far. Tui provide a reason to celebrate being a New Zealander which far surpasses even the dolphins I often encounter when sailing my beach cats out in the bay. I say that because dolphins can be enjoyed anywhere on a coast the World over. Tui are a special concoction of flight, eclat and chortling song and acrobatics, especially when drunk on natural highs they seem to crave... Bless them. 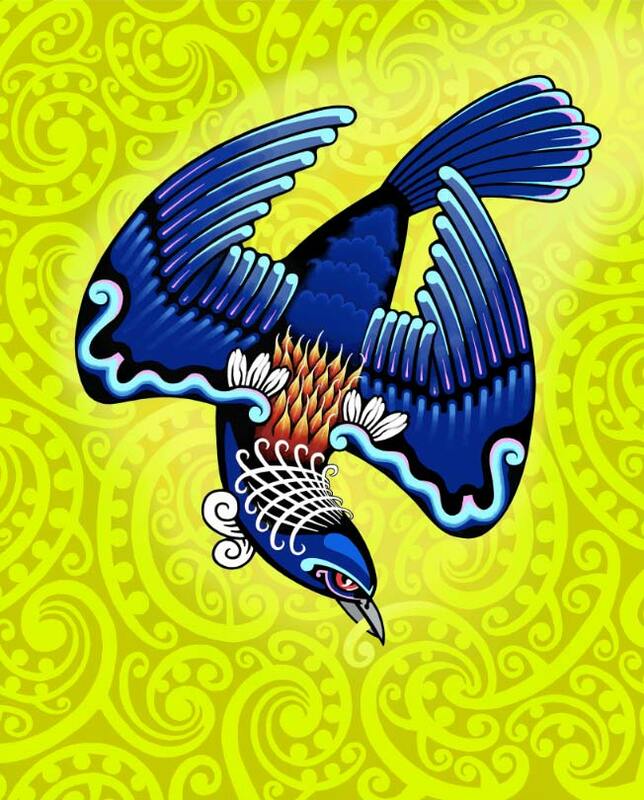 Transfixed, this time I bring a vibrant post Schoon kowhaiwhai pattern delivering the bright greens and golds of spring and the bird fascinating all with it's iridescent, fabulous outfit while it performs a tight turn.